I’ve never lived in a jacket so much as I have with the Outdoor Research Starfire Hoody. This winter it’s almost always one of the first things I put one when I jump out of bed and the last thing I take off before jumping back in. 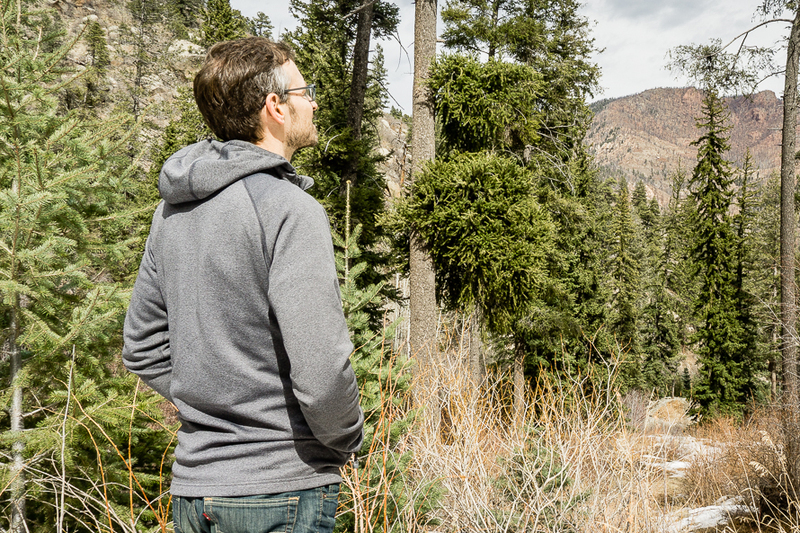 Outdoor Research built the Starfire Hoody using their Trim Fit. If you’re shaped like a European guy like me, you’ll love this. The jacket is cut to move with you without extra weight and bulk. I’m a stickler for a great hood and the Starfire has it. While not big enough for a helmet, it’s also not tight enough to look silly if you wear it around town. It’s perfect to add a bit of extra warmth and I’m even wearing it now as I type. A tight polyester knit is used to make this jacket durable and stylish. It’s quick drying and uses Polygiene® Active Odor Control. Yes, it works. I’ve been wearing it nearly every day for three months and have only washed it once. The system either works or I’ve learned to deal with my stench. Since my wife is still with me however, I lean more towards the former. Outdoor Research advertises a back length of 28″ on the large size. At 6′ and 150 pounds I’m wearing a size medium and it fits perfectly. No awkward cold air up the back when I bend over. Obviously this jacket is a hoody and there are pros/cons to that for me. Mid-layers with hoods are generally too bulky for me to wear under a shell. I do like to wear it hiking, on light sunset strolls with my hot wife, and of course, lounging around the house. In spring and fall when temperatures swing wildly I almost always have a jacket like this handy. It’s definitely one that will protect and keep you warm outside while not making you look like you just climbed a mountain when you wear it to work.